Swashbuckling adventure. A heart-stopping rescue. An army on the hunt. And yet, despite it all, a quiet book. 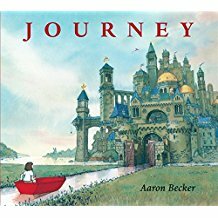 Aaron Becker, the author-illustrator of the book has pulled off the seemingly impossible—reconciling two contradictory elements to make a story that sweeps the reader along on a fantastically magnificent journey. And all this, without a single word on the page. —lives fearlessly, not trapped by circumstance. We can talk of living fearlessly, of choice, of responsibility, and go wherever else the conversation flows. This is a book that encourages talk. In books we read the words. In a wordless book we read pictures, and learn to spot and decode the minutest details. Aaron Becker offers his readers a book brimming with details that add depth to the story, contained within art that could grace the walls of any home. This is a book that definitely belongs in all schools and libraries.